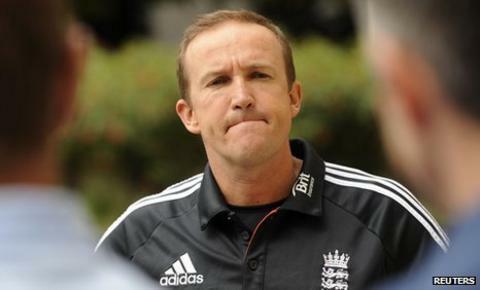 Andy Flower has admitted England were not fully prepared for the Test series against Pakistan. The tourists were beaten by 10 wickets inside three days in the opening Test in Dubai. It was their first Test in five months, and their first defeat since losing to Australia in Perth in December 2010. "To be quite frank, I think we might have been a little undercooked after people's time off pre-Christmas," team director Flower told BBC Sport. "This is a proper reality check and, if there were any thoughts of complacency, they have been banished. "We did not come here expecting to win every game. We do not think we have any right to win games." England had not played a Test since the innings-and-eight-run win over India at the Oval last August, and no international cricket since the final one-day international against India in Kolkata in October. "We needed the break as well, and you cannot have it all ways," Flower added. "The players needed the mental and physical break from the rigours of competition. "But we weren't on the ball and weren't sharp enough to deal with what Pakistan challenged us with in this game." England, the world's number one Test side, were bowled out for 192 and 160 in what was their first Test in the United Arab Emirates. Video: Vaughan urges England to "raise game"
Off-spinner Saeed Ajmal took 7-55 in the first innings, while pace bowler Umar Gul dismissed Andrew Strauss, Alastair Cook, Jonathan Trott and Kevin Pietersen in the second as England's top six mustered only 143 runs between them in the game. "We didn't play him well," Flower said of England's failings against Ajmal. "As a batting side, a number of our individual batsmen made poor decisions, and this result is a sum of those decisions. "Tomorrow, we have access to the spin bowling machine 'Merlyn', and it is a chance for our batsmen to get clarity about their game plans against spin. "We have been exposed in this Test match, and need to come back better in the next one." Flower has warned his players they must improve markedly when the second Test gets under way on 25 January in Abu Dhabi. "You have to play really well in Test cricket to beat the opposition," he said. "They outplayed us by a long margin in this Test and deserved the victory. "It is now our challenge to get back on track, and put them under some pressure at the start of the second Test."